Fetish for FIGS… | Jots from a Small Apt. And plopped in my chair. There was room for one more. And not far behind came FeFiFoFum! And five fractured FIGS bid each a good night. I love the combination of illustrative lines, color, and pattern 🙂 Nice work! One can never have enough of…figs. I love figs, they are so tasty. This painting is incredible, and the words as well…funny an seem written with a great mood 🙂 Reminds me of the fig tree outside my grandmother’s house. Happy Holidays! What zing in you work. Love it ! You’re very welcome Jots ! It’s amazing, isn’t it, the wonderful “others” who come knocking on one’s door? I appreciate your visit. Thank you for the colourful comment! Coffee through the nose on the stapled arses comment. Neither one…coffee through nose/stapled arses a pretty sight!! Laughing loudly…I think I woke up my neighbours! LOL … just popped over to see if I missed a post during my time away last week … and then I laughed while thinking … this is why you mentioned Fig Day. 😉 Cheers and smiles to you on this day! Actually, aFA….I have another one coming off the drawing board…which is why I needed dispensation to add another “Fig Day” to your Day Dairy! Just needed some assurance that…frolicking figs were not to be forgotten…if I had my [continuing] way. A stunning study in colours and ink. The figs looks both delicious and inviting. Madness? What is all this talk about being mad?! Enjoy the weekend. Keeping my fingers crossed for snow this weekend!! Now that’s madness…! Thank you so much for the “colourful” comment. Oh, how I want fig jam now! Or to go climb on the towering old fig tree in what used to be my grandmother’s back yard. Lovely! That sounds beyond heavenly. And I’m happy to be here! “Fetish for Figs” is gorgeous, Jots! I like the linework in and throughout the figs because drawing always is my first love. Then the color and the composition with the black and white checkered background! Amazing! Glad you said that, Leslie…”…drawing always …first love.” I’m such an inadequate watercolourist….drawing always pulls me back into the fold of comfort zone. I know. I know…be brave..accept a new challenge. I’m trying……. Stop it. Just stop it right now! I so admire your ability to both write and illustrate! You’re welcome! And that’s a bummer –I have no idea why you can’t receive my posts. If you don’t mind contacting WordPress support, you can ask them. That’s what I’ve done in the past when I don’t receive blog posts and they’ve always corrected the problem. Beautiful drawing. Love pen and ink work. And I think your words sum up just how much you enjoyed it too! You get bonus points for your alliteration as well as the revamping of ‘Twas the Night Before Christmas. Do I now have enough points to win? Love the colors in this one! … and the words caused a smile and a chuckle! Well done, Raye! Hey aFA…hope you and Mrs. aFA had a good weekend..you know…. Thank you [always] for your own colourful words! hmmmm …. tough times here, but we’re staying strong. Definitely not our normal weekend. This is the difficult part as the children who are adults. I know from recent experiences that it takes a lot of support. Know that you have mine. I absolutely know … and am very appreciative of your words. I’ll be updating in about 70 minutes. This is really fiendishly good, both pictorially and verbally. Jots your talents just keep on coming. You are too kind, J. A filigree feather in my felted fedora! Your favourable flattery leaves facility to phonate (cheating is good) failing in filtration. Flushed with frisky frolics!! I am out of “f’s” so we need to move on to another lettered fruit. This has been fun. I’m looking forward to your foray into children’s lit with the upcoming “The Adventures of Fester F. Figg”. I’m thinking the illustrations will be as captivating as the story. Another challenge? A festering folly for FIGGY delights just might be the answer to Portland’s long winter nights. Oh yes….my absolute favourite delicacy! Did you know that Jo Malone (fragrance diva from London) has a Wild Fig & Cassis Cologne? Another favourite…but of course! Your “mad, mad, mad” comment, MM, sums up so many other fun-facts about Jots! aha! am home sweet home with sluggish internet, and the page won’t open – but alas! i can hit the ‘reply’ button, and my comment should reach you! this is BRILLIANT and fun and you are a genius! Genius? Perhaps not, Z! Just lightening the load of a very gray day here in Portland. Glad you are home safe and sound. I’ve missed you…..we need to have a sit down…. Your own version of “The Night Before Fig Fest” – brilliant! Loved the painting as well. Absolutely “The Night Before FIG Fest”…brilliant!!! 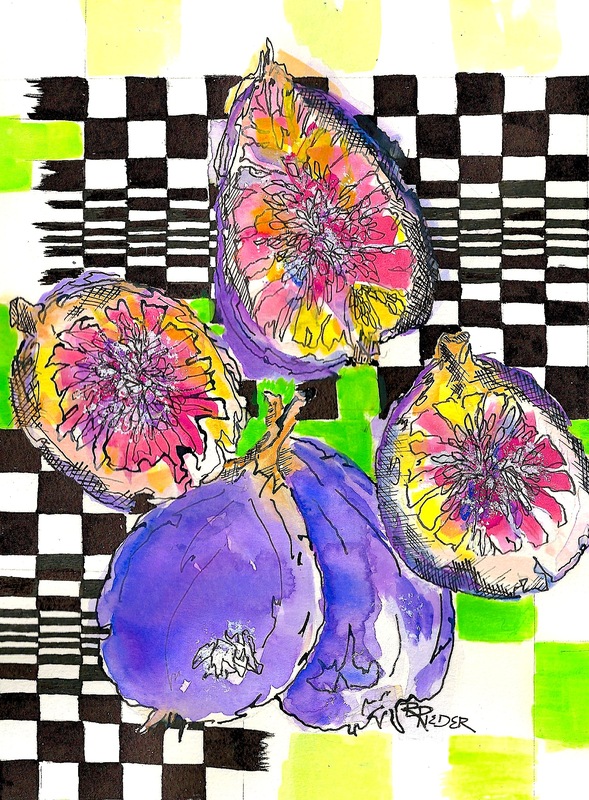 Don’t give me anymore mad, mad, mad ideas…..
Love your figs and your words! I’m beginning to think you are just as silly as I am…. No…I know you are just as silly…..!